This piece features a beautiful display of various cuts of Diamonds formed into brilliant cluster formation. The cluster is made up of Round cut and Baguette cut Diamonds that have a total weight of approx. 0.70ct and are excellent in Diamond quality. 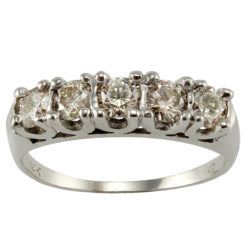 The simple, but timeless, mounting is made from a generous amount of 18kt white gold.